(Nanowerk News) Tufts University biomedical engineers are using low-energy, ultrafast laser technology to make high-resolution, 3-D structures in silk protein hydrogels. The laser-based micropatterning represents a new approach to customized engineering of tissue and biomedical implants. The work is reported in a paper in PNAS Early Edition published September 15 online before print ("Laser-based 3-Dimensional multiscale micropatterning of biocompatible hydrogels for customized tissue engineering scaffolds"). 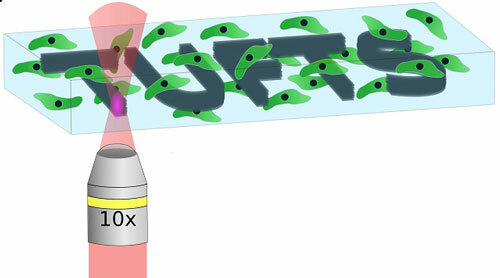 Illustration of laser-based micropatterning of silk hydrogels. The transparent gels enable the laser's photons to be absorbed more than 10 times deeper than with other materials, without damaging the cells surrounding the "Tufts" pattern. Artificial tissue growth requires pores, or voids, to bring oxygen and nutrients to rapidly proliferating cells in the tissue scaffold. Current patterning techniques allow for the production of random, micron-scale pores and the creation of channels that are hundreds of microns in diameter, but there is little in between. The Tufts researchers used an ultrafast, femtosecond laser to generate scalable, high-resolution 3-D voids within silk protein hydrogel, a soft, transparent biomaterial that supports cell growth and allows cells to penetrate deep within it. The researchers were able to create voids at multiple scales as small as 10 microns and as large at 400 microns over a large volume. Further, the exceptional clarity of the transparent silk gels enabled the laser's photons to be absorbed nearly 1 cm below the surface of the gel - more than 10 times deeper than with other materials, without damaging adjacent material. The laser treatment can be done while keeping the cell culture sealed and sterile. Unlike most 3-D printing, this technique does not require photoinitiators, compounds that promote photoreactivity but are typically bio-incompatible. "Because the femtosecond laser pulses allow us to target specific regions without any damage to the immediate surroundings, we can imagine using such micropatterning to controllably design around living cells, guide cell growth and create an artificial vasculature within an already densely seeded silk hydrogel," said senior author Fiorenzo G. Omenetto, Ph.D. Omenetto is associate dean for research, professor of biomedical engineering and Frank C. Doble professor at Tufts School of Engineering and also holds an appointment in physics in the School of Arts and Sciences. The research team reported similar results in vitro and in a preliminary in vivo study in mice.